Slinger Tennis Ball Launcher Review — Worth It? As a tennis ball rookie myself, playing tennis ball alone with no one around is almost impossible — you will need someone to serve the ball for you. For sure, getting a tennis ball launching machine is a good option, but not with the $1000+ price tag on it, it’s too much for a rookie like me, as well as people just like me. Here in this article, I am going to take you through this affordable new tennis ball launcher project called Slinger, and ultimately, to give you a good idea of whether is this launcher really worth it. This launcher comes with a carry-on style where you can keep the rackets and balls all in the separate compartment and transport with ease. Beside of the handy features like the built-in USB charger and customizable ball-serving options, the main selling point of this launcher is none other than the affordability. To give you an idea, the cheaper option I can find on Amazon is this one by Lobster, which is still kinda pricey, and also this one by Match Mate for almost half the price. In terms of overall functionality, Slinger is very much resembling the Match Mate. Review and Discussion — Is this tennis ball launcher worth it? So, how does this compare to a more viable standard tennis ball launcher like this one? Uncomparable, period. First, Slinger is used for the sore purpose of pre-game warm-up (as stated in the KS description) instead of practicing. While you can still use it for training, the reason for that is because Slinger only allows adjusting the ball serving speed and frequency. For training, you will need a good machine to serve balls on different height, spin rate, angles, feed rates, oscillations and more. So, I doubt that this clunky launcher will serve almost no purpose after the warm-up session, except being a huge smartphone power bank. However as for the price suggest, there is not much we can expect for this ball launcher. Throughout the funding, many backers have suggested to include a remote control as the stretch goal. However, there will be no remote control for this version of Slinger. The creator has included a survey at the end of the campaign where backers can vote for the remote control which is expected to be available in the 2.0 version. In other words, the creator is currently not planning to re-design the Slinger 1.0 nor including it as a stretch goal. The other concern of this tennis balls launcher is the battery life which claimed to be 5 hours per charge ideally. Sadly, there is no battery status indicator, power cord option and mobile phone integration like others. While the playtime is greatly affected by the smartphone charging (may take up to 40% of the Slinger battery per full charging) and ball serving’s setting, the 5-hour claim is apparently using the bare minimal setting — the lowest speed and feed rate. For this, the creator doesn’t respond clearly to this question despite being asked for multiple times. In other words, if you took a full charge with your phone and set Slinger to a somewhat optimal setting, you will be expected to have a Slinger playtime of 1-2 hours, or lesser. That said, the gimmicky phone charging feature serves more of an emergency power option rather than a ready battery source. Slinger is made up of plastic. If we’d compare it to the standard metal-made tennis ball machines, Slinger is more of a plastic toy for kids. Although it has been advertised with “good durability”, there is no testings to support the claim and to show Slinger can really take up a good impact from the balls. The other popular unanswered question is the ball travel speed where it’s said capable to reach up to 80 mph. The footage video actually showing the ball launching at just 30 mph. For this, many have wondered if this 12lbs lightweight launcher really able to feed balls at the top speed under the shortest interval. The creator has mentioned a few times saying that they will do their best for the transparency, but apparently, the last thing they did was the transparency. It’s not hard to notice that the thin on-page information, and also they sidestepped many constructive questions asked by the curious backers. Typically in the crowdfunding platform, low accountability and trustworthiness are one of the reasons people dropping out their pledges. In overall, is this worth it? Yes and no. What I can say about this device is that it works for sure, but not that “capable” as many expect. However, as using the lowest-in-class price range as their selling point, it’s hard for them to add-in more feature at the moment while to stay competitive with the established machine like this one. This is perhaps the reason of why the creator remains silence despite being bombarded by the same questions over and over again. The price does not include the shipping fee ($40) and customs taxes. If you think this is for you, feel free to check out the link below. This campaign (and offers) will end on Thu, June 21 2018. But that’s without the racquets, water bottle and the 72 balls it is designed to carry. 72 balls weigh 10 lbs, so that makes it 32 lbs and probably close to 40lbs with the racquets and water bottle, the same as a Spinfire or Lobster machine! As such this is hardly a ‘First Ever Ball Launcher in a Tennis Bag’ as they like to advertise on their website, http://www.slingerbag.com/. You want to carry 40 lbs on your back? – Lastly, massive design change from something custom to something that looks horrible. See comparison pics: https://www.dropbox.com/s/3skcc49n6agci1f/Slinger%20comparison.jpg?dl=0%20). The wheels are not custom anymore, the body is basically now a square box vs the contoured one from before, the flaps look cheap, etc. 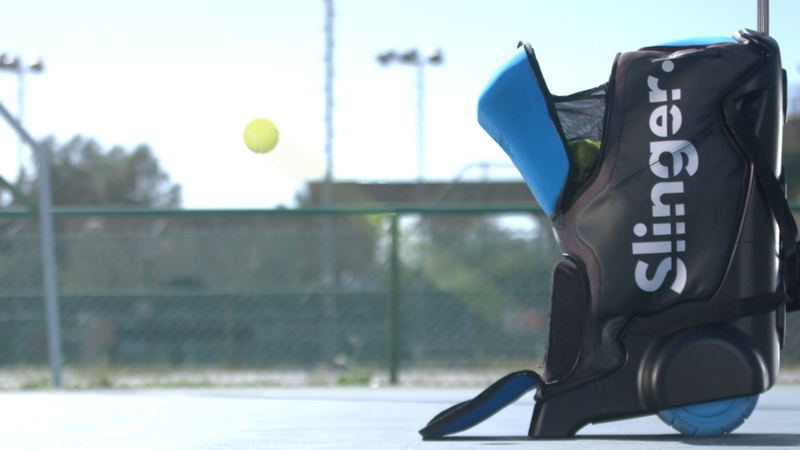 This when on Kickstarter, Joe Kalfa, the inventor stated on there that in August 2017 ‘a revised but early version Slinger makes near daily trips to the court for testing and bug-checking. It seems this was a classic bait and switch and there was no real working model back then and that the machine was a mockup using the Theranos deception method perfected by Elizabeth Holmes. This was obvious to me from the beginning as Joe Kalfa was never transparent and continues along that track even now. When backers asked last year that he prove the machine could shoot balls to the baseline and at 80mph he kept using the excuse the machine was ‘with the engineers’ and so he couldn’t provide that proof. As if!!!! On top of all of these downgrades, all the points in your original article are still valid.